Based on Egon's new StructureWidget, I constructed an Editor to browse SDFiles in Bioclipse. It uses lazy UI rendering and is shows very promising performance. Apart from reading and rendering the structure, it also reads and displays properties in a table. 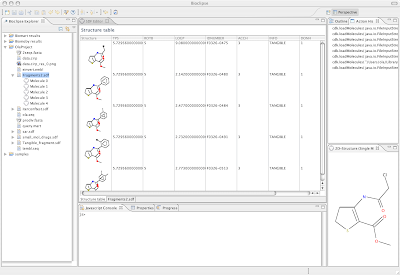 Indeed a very important feature-addition towards open source QSAR in Bioclipse! I'm delighted to announce the addition of a new Bioclispe plugin entitled 'Jnanotube'. The plugin makes it possible to easily create nanotube structures in Bioclipse. 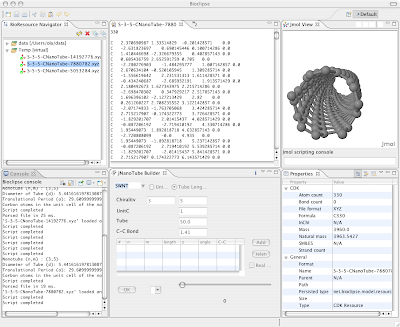 The plugin adds a new view, 'Jnanotube' which consists of GUI components that are able to generate virtual XYZ files that easily can be displayed in the JmolView. The plugin was contributed for the Bioclipse 1.2.x branch by Joe and Sam, and I hope they will continue to support the plugin for Bioclipse2 as well, and are looking forward to other additions from them (they have hinted that they are building a peptide-builder plugin). So far the plugin is not part of a Bioclipse release, but we will include it in the next 1.2.x release.